In October, I made this rice pudding for my youngest daughter's birthday lunch. I photographed her helping me make the pudding in her Minion costume with plans to post the recipe on the blog within the next few days. A few days turned into a few weeks and then into a few months. So, I thought, I will do again for my older daughter's birthday in January. Now, only 3 weeks later, here we go! I love rice pudding SO much, and this recipe is so easy and beautiful because you can just pop it in the oven while you are making the main meal. It should be very runny when you put it into the oven because the arborio rice absorbs so much liquid. If you find when you've taken it out the oven that it is a little dry, just stir in some cream or whole milk to loosen it up. 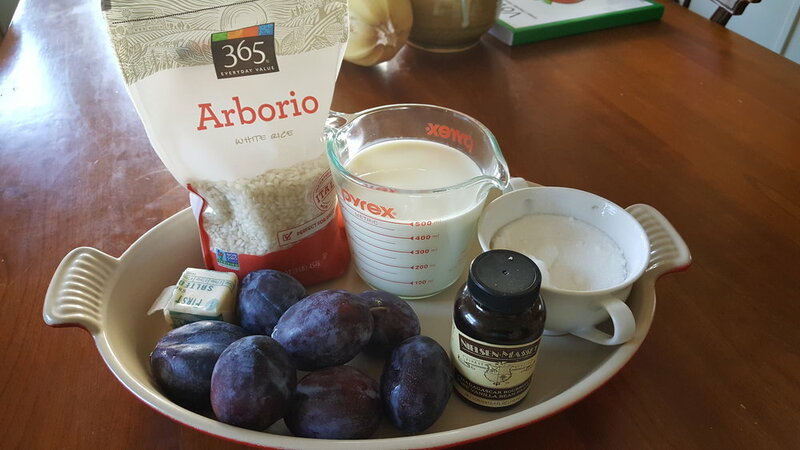 I used Italian plums the first time around because they were in season, but by January they were no good so I used apricots. You can use any stone fruit you find. This is stolen completely, an unabashedly from David Lebovitz. If you haven't read his new book "L'Appart" you should. Such a fun trip (for the reader, not David) into Parisian real estate hell. I am thinking of making this again, for someone else's birthday (anyone have a birthday coming up...anyone?) 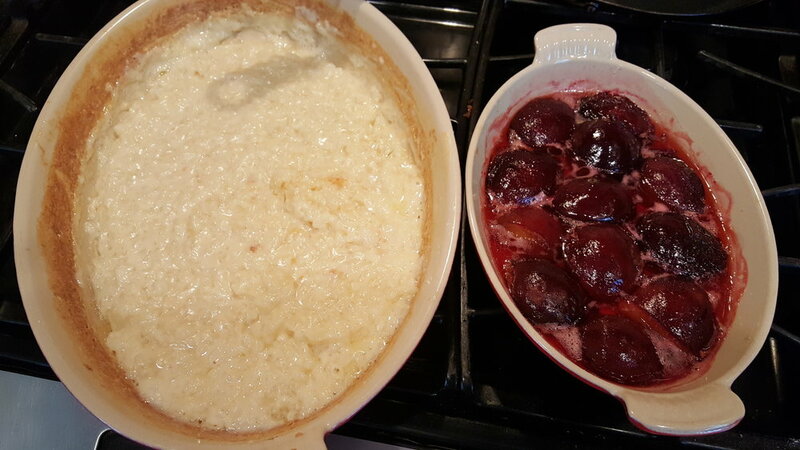 and using dried cherries in the pudding and naval oranges as a sauce. 1/2 vanilla bean, split lengthwise with seeds scraped out, or 1/2 tsp. vanilla bean paste. In a 2 quart baking dish, mix together rice, sugar, salt, and vanilla bean and seeds or vanilla bean paste. Pour in the milk and stir. Place bits of butter evenly over the mixture. Place in oven. Meanwhile, make compote Slice stone fruits in half, removing seeds. Place them in a baking dish big enough to accommodate all the fruit in a single layer. Mix vanilla bean paste or seeds with wine and then pour over the fruit. Sprinkle the top evenly with sugar. Cover the fruit with aluminum foil and place in oven for 15-20 minutes until soft and cooked through. Cook the pudding for a 1 hour 45 minutes, making sure to stir every 15 - 20 minutes. Remove from oven and allow to stand for rice to finish absorbing liquid. Serve warm or room temperature with fruit compote or any other topping you desire.